Used for preventing asthma attacks. In vitro studies suggest it reduces growth of cancer cells. This extraordinary algae grows abundantly off the coasts of Japan and Korea, particularly around the island of Jeju. It is very popular with the people of Japan and Korea and is often consumed as part of their diet. It may even form the basis of the diet of the legendary Japanese “ama” or “diving grannies”, many of whom are approaching their seventies and for whom it constitutes a nutritional fountain of youth. In recent years, a growing number of scientific papers have documented its many biological activities. This edible brown seaweed from the laminaria family contains antioxidant polyphenols that are significantly more powerful than land-based antioxidants (vitamins C and E, catechins, resveratrol ...). Known as phlorotannins, these substances are only found in brown algae and are produced entirely by polymerisation of phloroglucinol. Like alpha-lipoic acid, these antioxidants have a key advantage in that they act equally well in both aqueous and lipid environments, making them particularly valuable for protecting nerve cells in the brain since they cross the blood-brain barrier easily. Scientists have shown that the higher a molecule’s content in benzene cyclic rings, the greater its antioxidant potential; compared with resveratrol which contains two, and green tea catechins which contain four, the active compounds of Ecklonia cava have eight, earning it the nickname “free radical killing machine”! It maintains healthy blood pressure by inhibiting the activity of angiotensin converting enzyme (ACE), which plays a key role in regulating blood pressure. According to one study, the main phlorotannins responsible for this effect are: phloroglucinol, triphlorethol-A, eckol, eckstolonol, dieckol and phlorofucofuroeckol (PFF). • Its action is similar to that of certain “anti-ACE” fish peptides (sardine, herring, and mackerel) which also restrict production of a powerful vasoconstrictor, angiotensin II, thus maintaining healthy blood pressure levels. It improves blood viscosity by balancing plasmin and reduces oxidation of LDL-cholesterol, one of the most specific risk factors for atherogenesis. It maintains flexibility of the arterial wall, improving circulation within blood vessels by more than 50% in six weeks. As mentioned, the phlorotannins in Ecklonia cava are able to cross the blood-brain barrier with ease. Studies have demonstrated that they increase the concentration of acetylcholine in the brain by inhibiting cholinesterase, in a similar way to huperzine-A. 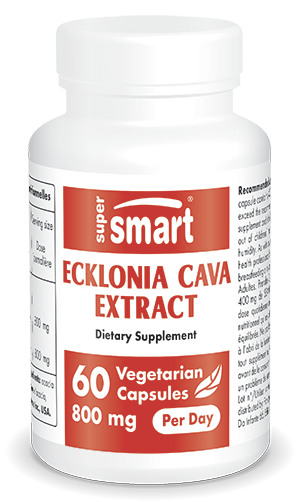 Ecklonia cava thus helps support memory function. Other research has shown that it reduced the formation of beta-amyloid plaque in the brain - responsible for memory problems in elderly individuals - by 40%. Ecklonia cava also increases alpha brain waves, creating feelings of calm and serenity, in a similar way to L-theanine. • inhibiting the MMP-9 enzyme which attacks collagen, the major constituent in cartilage. Taking Ecklonia cava helps lower blood glucose levels by inhibiting the aldose reductase enzyme. In this way, it restricts production of sorbitol, a sugar alcohol that can alter the optic nerve and its surrounding nerve cells. It has also been shown to be effective at reducing excess weight by regulating a key enzyme in lipid metabolism: DGAT, involved in intestinal fat absorption, regulation of plasma triglycerides, adipocyte fat storage and muscle energy metabolism. Supplementing with Ecklonia cava helps increase stamina during physical exertion and may be beneficial for sexual health, particularly in the case of erectile dysfunction, since its dieckol content improves the release of nitric oxide (NO), facilitating blood vessel vasodilation. Ecklonia cava contains several active varieties of polysaccharides - fucoidans - which are of particular benefit in cases of proven immune deficiency (cancer, viral epidemics, HIV) because they increase numbers of natural killer (NK) cells. Some studies suggest this algae may also have a bactericide effect on salmonella and staphylococcus. Ecklonia cava Extract contains a daily dose of 104mg of Ecklonia cava extract standardised to 15% phlorotannins. This phytoceutical has no contraindications or side-effects and can be combined with any other supplementation, including medicinal supplements. For optimal efficacy, a dose of 2 vegetarian capsules a day, for 2 to 3 months, is recommended, extending the supplementation period if necessary.